An effective, liquid Silica Supplement. Boost your crop’s defences against biotic and abiotic stress. High analysis Potassium Silicate for boosting plant Silica levels. Silica is one of the forgotten nutrients when it comes to plant nutrition. Silica has many benefits to offer by building the plant’s capacity to protect itself from pests, disease and abiotic stress factors. AgriSil contains Potassium Silicate in a plant-available form, designed for agricultural use as a foliar or soil application. Unfortunately silica is deficient in 70% of South African soils. 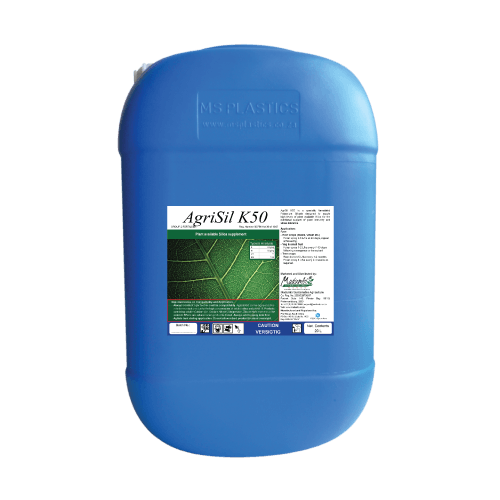 Buffering agents – Not all buffering agents are compatible with AgriSil K50®. Tenderbuff has been confirmed to be compatible with AgriSil K50. Aqua Rite 5 is not compatible. Check for compatibility before making large tank mixes. Always conduct a jar test before mixing product or consult your distributor. salts of magnesium, calcium, zinc and aluminium. High alkalinity will irritate skin and eyes. Avoid all contact with skin and eyes and take necessary precautions when using the product. In case of accidental contact immediately flush eyes with clean water and seek medical advice. Fill spray tank with half the required water volume and start agitator mechanism. Ensure adequate agitation is maintained during mixing and application. Add the AgriSil K50 to the tank. Complete filling of the spray tank. If required pH of tank solution may be reduced to pH 4 with citric acid. This will improve compatibility in a tank mix, particularly with acidic fertiliser products. Add any other products to be tank mixed. Apply as a full cover film spray or as a soil drench as applicable. Conventional application equipment may be used. Foliar applications are more effective when applied in early morning or late evening and not during the heat of the day. AgriSil K50 is a salt product and any salt may cause leaf burn if it dries too quickly on the leaf surface. Although reports of Phytotoxicity are rare, evening applications will help to reduce the possibility of leaf burn. AgriSil K50 on its own, when applied at the correct dosage, will not cause burn. However, if applied in the incorrect conditions, it can become a contributing factor and caution must be taken. Row Crops: (maize, wheat etc.) Foliar spray 0.5 L/ha at 20 days, repeat at flowering. Veg & small fruit: Foliar spray 1-2 L/ha every 7-10 days following emergence or transplant. Tree crops: Root drench 5 L/ha every 1-2 months Foliar spray 4 L/ha every 2-4 weeks as required. An extremely soluble plant available form of silica. It is a highly-concentrated, highly-soluble liquid formulation potassium silicate designed for agricultural use. Silica strengthens plant cells. Silica is a key element in plant defence systems and is required for optimum plant function. Non-toxic agricultural input with no MRL requirements. Non-toxic and residue free. Efficient uptake of silica with results achievable at comparatively low application rates. Improve general plant heath and produce quality. Improved cell strength results in improved crop quality (e.g. reduced lodging in barley, shelf-life of flowers/fruit, etc.) 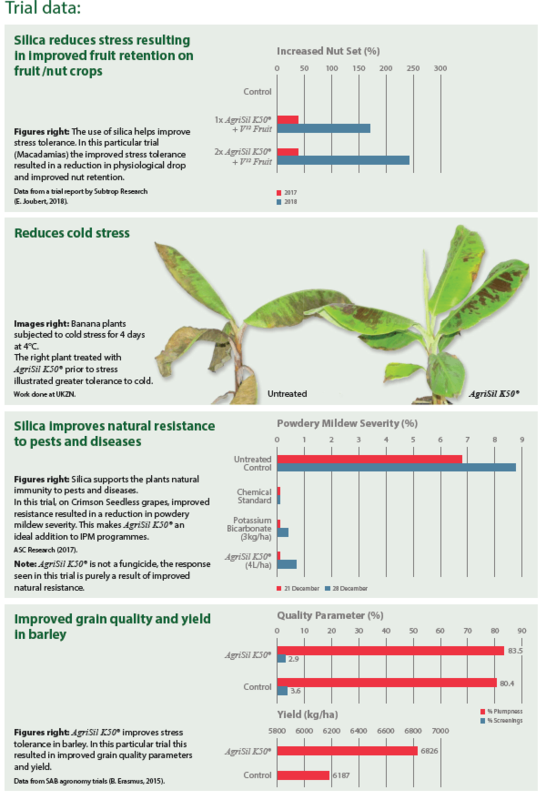 Improved crop tolerance to abiotic stress (e.g. heat/cold/drought/frost) and related crop losses (e.g. physiological fruit drop). Improved natural resistance to a wide range of pests and diseases making AgriSil K50® an ideal partner in any IPM program. A cost effective tool recommended to support any sustainable pest and disease control program. Improve resistance to pest and disease by supporting the plants natural immune system. Enhance the efficacy of pest and disease control products potentially allowing for a reduction in the frequency of chemical applications. sufficient silica available to the plant, resistance responses are more complex and occur quicker. or disease. It simply helps activate and enhance the plants own natural resistance mechanisms.